Damper mechanism and spring technology, suitable for the doors 10-250kgs (22-550lbs) weight. 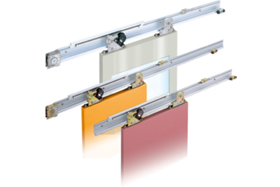 Need Accessories For Sliding Door Closers? Click here for various option items/accessories/parts for the NSC/DSC series Sliding Door Closer. (*1) The NSC/DSC series sliding door closers can be used on either steel or wooden doors. The system comes with machine screws. If you are going to install it onto wooden door/wall, please prepare the following screws (equivalent sizes are ok). In addition, to avoid the door to swing, you may prepare a suitable bottom guide. *The rail can be cut into preferred length. *The complete system comes with either 2.2m (86.6”) or 3.1m (122”) rail. *KIT-version is also available that comprises of all components of complete system except rail. *Complete system includes pull spring device, damper control device, control rack rail, door hangers, door stopper, installation accessories and rail track. NSC models utilize the adjustable pull-spring device to close door and DSC models use the inclination (= gravity) to close door. For NSC models, the rail can be simply installed level (horizontal) to the floor and speed adjustment is easily done after the installation by turning a speed adjusting dial on pull-spring. For DSC models, the rail needs to be installed with proper gradient to achieve preferred closing speed so that delicate angling is required when installing the rail. NSC model is recommended for medium/heavy-duty doors as it is easier to install.